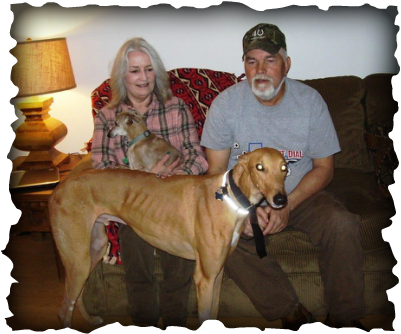 Anne and Nelson of Springboro have had Italian Greyhounds for years but finally got the bug to get a "big one" from our group vet Dr. Moore. KB's Mr. Doubles, now called Dusty, is going to have a wonderful life with this animal-loving family. He and female Italian Greyhound Dixie checked each other out and approved the match right away. We definitely see more big ones in this couple's future. Welcome to the GAGC family!